Former US Senator Scott Brown greeted people on the floor of the House Chamber at the Statehouse. State senator. US senator from Massachusetts. Would-be US senator from New Hampshire. Fox News commentator. And now, or soon, pensioner. 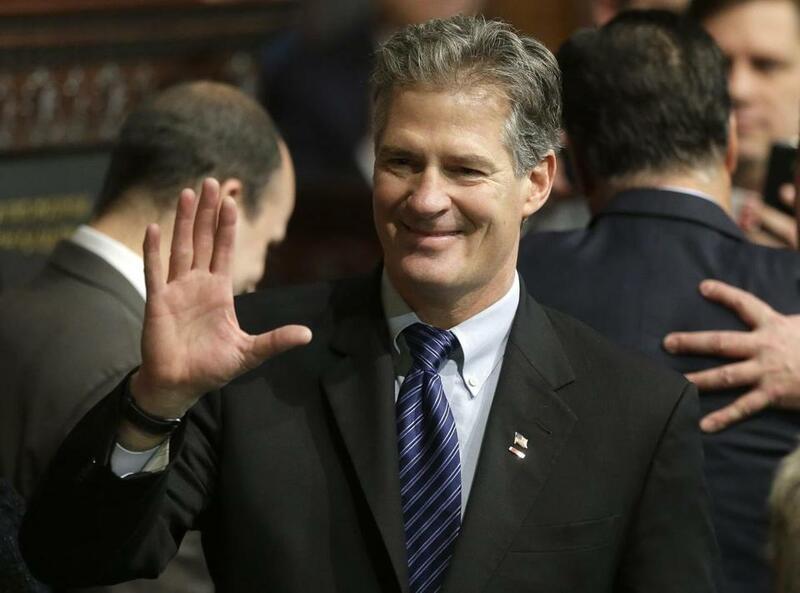 Former senator Scott Brown, who won a Senate seat in Massachusetts and lost one in New Hampshire, is ready for retirement. Brown has applied for his state pension, in Massachusetts, based on his nearly 17 years of state, county, and municipal service, which also entitles him to retiree health benefits. Brown, 55, filed his application to the State Board of Retirement on Nov. 17, 13 days after he came up short by less than 16,000 votes against US Senator Jeanne Shaheen, the New Hampshire Democrat. Availing himself of the public pension to which he contributed during his time in office clouds Brown’s political future, particularly if he chooses to remain in New Hampshire, political analysts said. Part of Brown’s core argument in last year’s campaign was that he had roots in the state, and was more philosophically aligned with its residents than with those in Massachusetts. “You can’t fault anybody for getting their pension that they’ve earned, but if you’re looking at running for another state office, it’s probably not the best timing or message you want to have delivered,” said Ron Bonjean, a Republican public affairs strategist in Washington, D.C.
Brown did not respond to voicemail messages left for him Friday afternoon. State pension officials are reviewing the application and checking the years of service and salary claimed by Brown in his application, said Matt Sheaff, a spokesman for Treasurer Deb Goldberg, in response to a public records request by the Globe. Based on the results of that review, pension officials will calculate what his monthly checks will total, beginning with his first check probably in the end of February. State pensions are based on applicants’ highest compensation over three consecutive years. Based on Brown’s application, if approved, he would draw roughly $60,000 per year. Brown’s annual compensation topped out at $76,440 during his final years in the state Senate, according to the documents he submitted to the state. Since losing the New Hampshire Senate race, Brown has remained in the public eye through his FOX News appearances, and regularly updated his social media presence. But he has not returned to the Boston law firm Nixon Peabody, where he worked in between his last two Senate races. In a Globe article published earlier this week, Brown said he had been enjoying Broadway shows, and more earnestly exploring his interests in guitar playing and cooking. Earlier this month, Brown met with former Florida governor Jeb Bush, who has taken steps toward a 2016 presidential campaign, and tweeted a photo of himself with his wife, Gail Huff, and Bush. That raised eyebrows in local Republican circles because of Brown’s long-running alliance with former governor Mitt Romney, the party’s 2012 presidential nominee. The same day, Romney floated the trial balloon of his own candidacy, which remained aloft until Friday morning, when Romney punctured it by telling supporters on a conference call that he would not run in 2016. Brown has not ruled out a future run for office. He rocketed to national fame with his 2010 victory over Attorney General Martha Coakley in a special US Senate election to fill the seat vacated when Senator Edward M. Kennedy died. In 2012, Brown lost to Democrat Elizabeth Warren and retreated to the private sector. In 2013, the Browns put their Wrentham home on the market, relocating to Rye, N.H., where the family has long maintained a vacation home. ■ Clarification: This story included the maximum possible amount Scott Brown could receive. A treasury spokesman said Feb. 4 that the rough estimate of Brown’s annual pension would likely be below $20,000.